On a chilly night, I felt like having some hearty spicy hot pot dish. So, I came up with this Korean-style sake-kasu soup. I made the broth with dashi-stock, kochujang, miso, ground red chili, sake, ginger, garlic, sugar, and sake-kasu (sake lees). 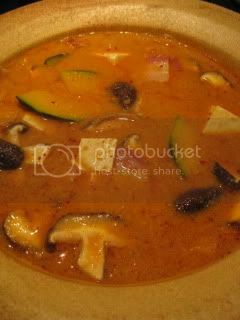 The ingredients cooked in the broth were sauteed kurobuta bacon, kabocha, shiitake and tofu. Bacon was actually the key ingredient to deepen the flavor of this dish. I used kurobuta bacon, which I got from Marukai in Gardena. It's really nice. I sauteed the bacon before hand and drained the fat before adding to the broth, so it's less greasier than using fresh pork belly. But, because it's cured meat, with just a small amount, it gave the very nice layer of flavor to the dish. Everything was cooked in one pot. 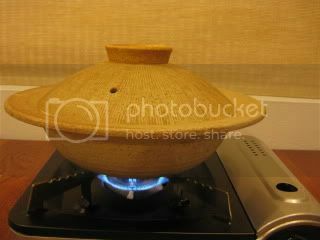 I used my light-body classic-style donabe, "Yu-Kizeto" for this dish. In about 10 minutes, the dish was ready. A couple of eggs were dropped in the soup right before turning off to make very soft poached eggs in it. The dish was served with thinly sliced scallion and cilantro. The broth was so tasty and gorgeous. Sake-kasu truly added the rich and warm taste to the dish. I enjoyed the soup also by dipping donabe-cooked rice in it. The egg was so nicely runny! Here's my recipe. 1. Combine the ingredients for the "seasoning paste" in a food processor. Pulse until they become a smooth paste. Set aside. 2. Saute the bacon for a few minutes. Transfer the cooked bacon to a plate with papertowel on it. Let the papertowel soak the excess grease from the bacon. Set aside. 3. Combine the seasoning paste, dashi stock and green part of negi in donabe. Add the bacon, kabocha, and shiitake. Bring to a boil and reduce to simmer. Simmer until everything is cooked through. Remove the negi and discard. 4. Add tofu and continue to simmer until tofu is hot. Drizzle the sesame oil. 5. 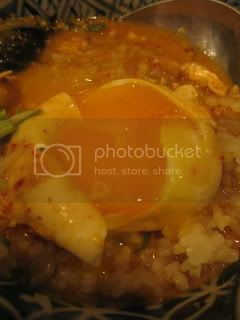 Add the eggs carefully in the center so that the yolks won't break. Simmer for a minute or longer if you like it more cooked. 6. Serve into individual bowls with the condiments. 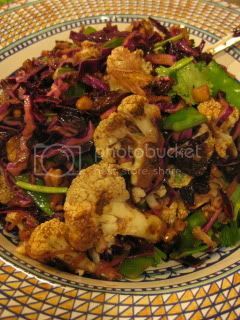 Nice side dish salad...roasted cauliflower, red cabbage, etc. were tossed in warm vinaigrette which is made from our home-grown orange and other ingredients.